Cape Town — The Confederation of African Football (CAF) has fired a senior official after he made corruption accusations against the organization’s president, Reuters reports. The agency's Mark Gleeson writes that this is a potential blow to FIFA’s efforts to clean up the game after various scandals worldwide. 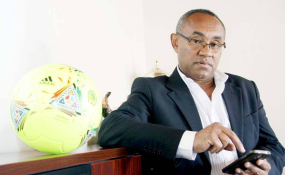 Reuters says CAF fired general secretary Amr Fahmy after the Egyptian accused his boss Ahmad Ahmad of bribes and misuse of hundreds of thousands of dollars. An internal document, sent on March 31 by Fahmy to a FIFA body that investigates alleged ethics breaches and seen by Reuters, accuses Ahmad of ordering his secretary-general to pay $20,000 bribes into accounts of African soccer association presidents. Ahmad, who is also a vice-president of world governing body FIFA, did not respond to requests for comment on the allegations against him, and FIFA declined comment.